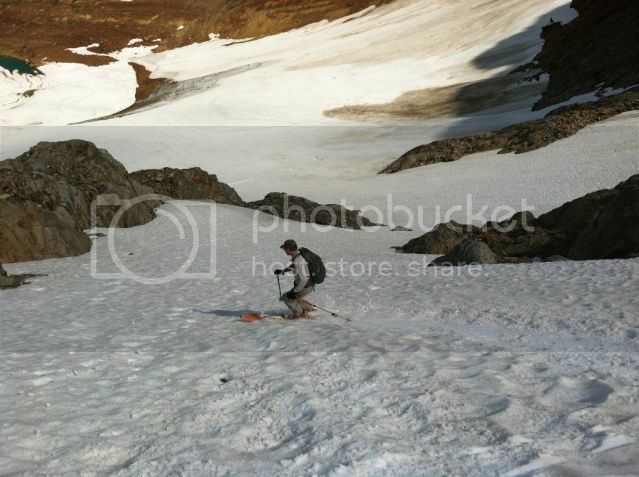 Andy Dappen and I skied the Lyman Glacier route on Chiwawa Mountain on Sunday, Aug.26.� We approached via Spider Meadow and over Spider Gap.� The skiing was continuous from the summit ridge at 8300' to the upper Lyman Lakes at 6080'.� This is a fun line with navigation around both minor and serious crevasses.� There was a narrow steep snow finger around an ice field, and a long, wide low-angle section which extended all the way to the glacier-green upper lake.� Ice axe and crampons both necessary. The camp scenario is worth discussing.� We had a spectacular starlight bivy situated right at the pass at Spider Gap with snow to the north (which we would ski in the morning as an approach to the base of the route), and Spider Glacier to the south (which we would ski on the exit). 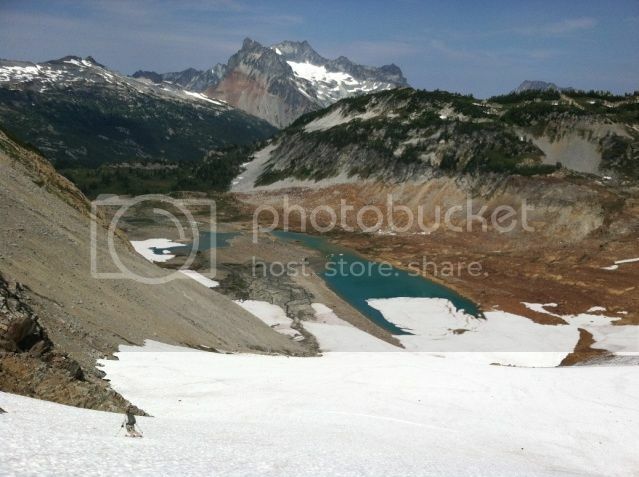 I had lobbied for a Sunday day trip, but Andy talked me into the overnight.� I concede that he was right, and I was wrong.� We wanted to be on the summit around noon, and this meant coffee break till 10:00 a.m.� (Contrast that with my plan of leaving the car at 6am).� Another great thing about waking up at the top of your 1st ski pitch is that when you wake up, you are already at the top and the first movement (well, maybe not exactly the first movement) of the day is skiing!� Plus, the late approach resulted in a moon-shadow ascent of the Spider Glacier which was magical.� No headlamp required or desired.� Anyway - Spending the night added value and I'm glad Andy talked me into it. Final thought:� There were a whole lot of crazy people at Spider Meadow.� Bonfires, giant packs loaded with dingle-dangles and S.P.O.T. beacons, horses, dogs and little kids.� One guy proudly displaying his Enchantments permit from 2009*, and Grumpy Lady who didn't want to say "hi".� All these people are enjoying the woods, which is good for them and probably good for the community, so more power to Grumpy Lady and hurrah for dingle-dangles.� Next time you see me on the trail I might have a Sierra Cup clipped to the outside of my pack. 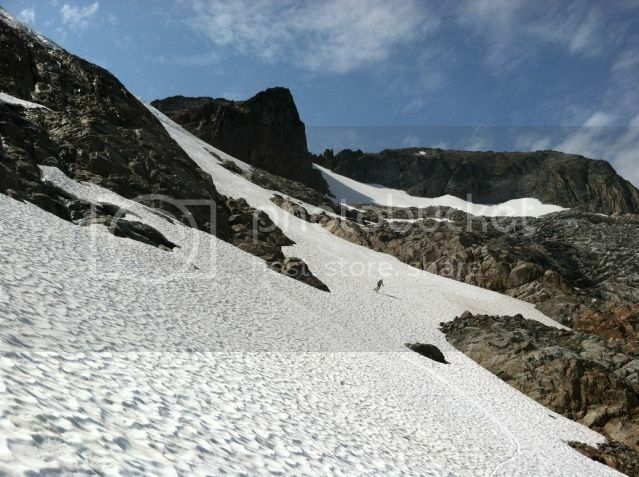 Coffe break is over.� This is the 'approach' to the main objective.� Dome and Gunsight in the distance on the right side of the horizon. 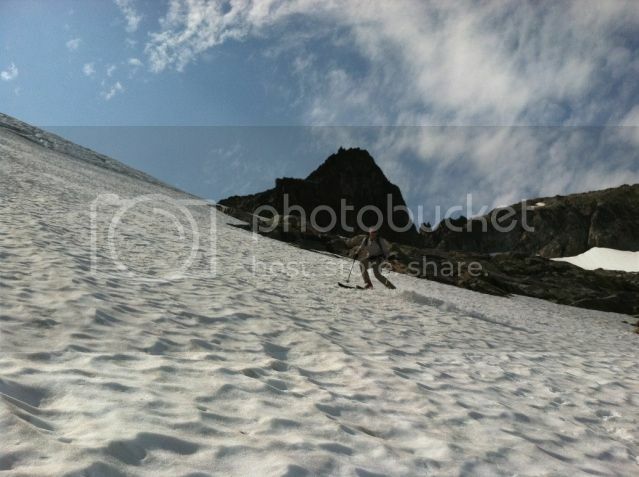 Crazy crevasse at the bottom of the top pitch.� Notice our tracks way over to the right. 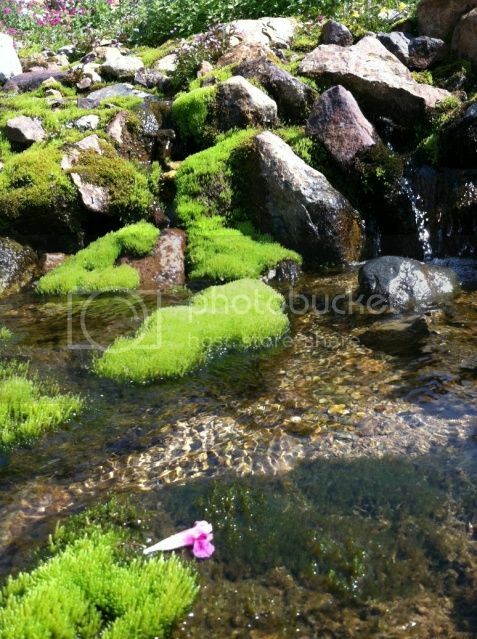 here is a good picture of the whole route.� Will still be good for a week or two!� Go get it! Thanks, Zap. Thought of you a few times on the trip. Every time I say to myself "I love these skis" I think of the only other guy I know who has them (which is you). I might go get it. Thanks for the TR. Awesome! Are you going to take that sweet VW camper out for one more adventure? 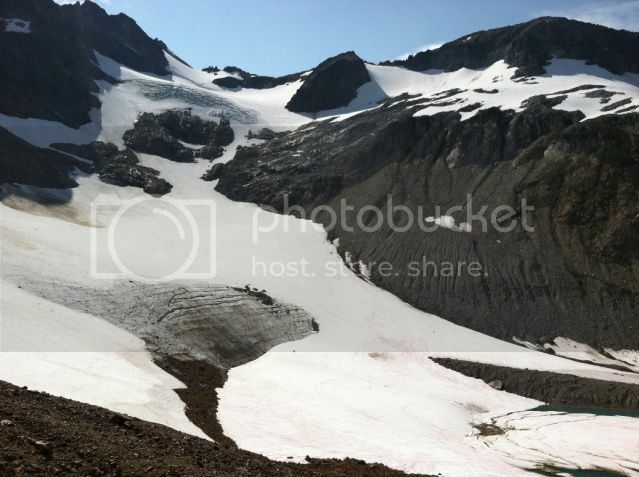 Cool - way to get after the late season turns!� We were just through Spider Gap a week ago, as the last part of an 8-day backpacking trip.� As I gazed up at Lyman Glacier and mentally pieced together the run you guys were to actually do (that gap to the right past the upper rocks looked sporty), my wife said something to the effect of "don't tell me you are wishing you had your skis with you!? "� I sheepishly replied that it looked like a fun line and that I wouldn't be surprised if someone might try it this late in the year.�Nice work! Nice one! Thanks for the details and to Andy for his awesome write up as well and esp. the access notes. 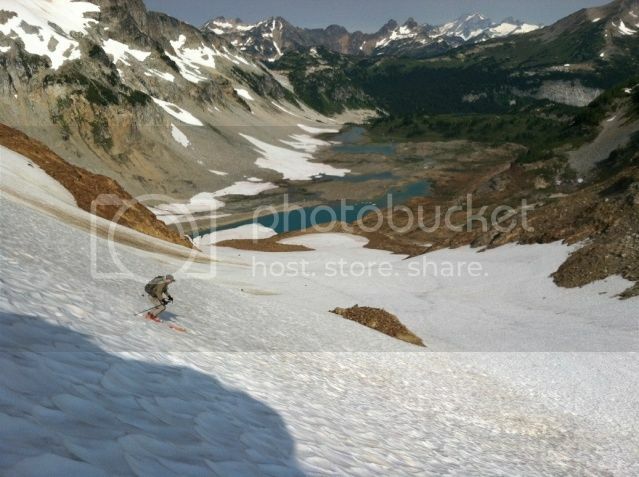 This is another amazing place to add to my list ski descents in WA. 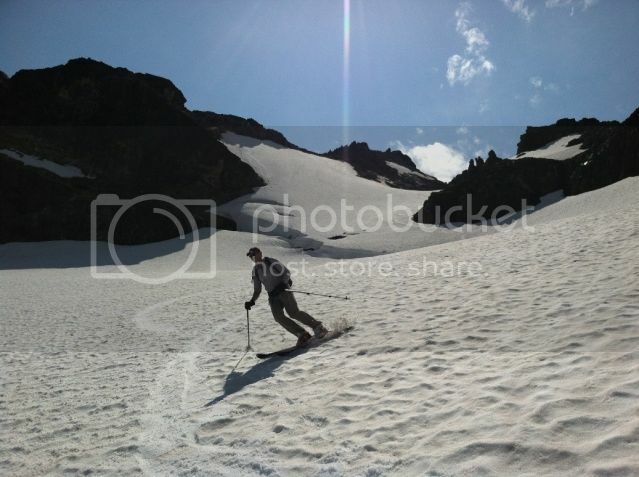 A great trip report, tha ski is sure one I want to do! Thanks.